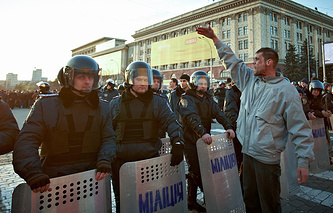 KIEV, April 8. /ITAR-TASS/. 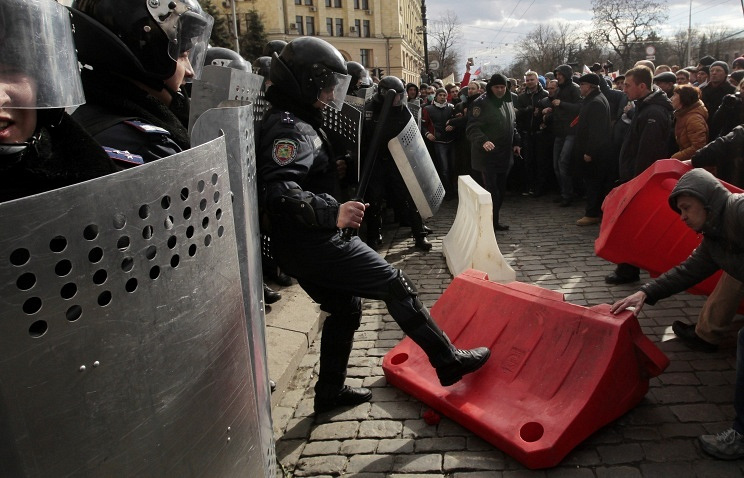 As a result of a special raid in Kharkiv, the building of the regional administration has been cleared. According to Ihor Baluta, Kharkiv Oblast head appointed by the new Kiev authorities, 70 people have been detained. “To date, the building of the regional state administration is guarded by law enforcement officers and servicemen of the armed forces of Ukraine and is completely ready for work,” Baluta said, quoted in a special statement published on the official website of the Kharkiv Oblast administration. He added that the counter-terrorist operation in the city would be continued. Earlier, parliament-appointed Minister of Interior Affairs Arsen Avakov has announced about the start of the counter-terrorist operation. “A counter-terrorist operation has started in the city. The city's downtown is blocked. However, there is no need to worry. We will open it as soon as we are done with the special operation,” he noted. Additional police commando forces were earlier dispatched to eastern and southern regions of Ukraine from other provinces of the country. “These special forces are prepared to settle operational tasks without taking into account details of the current local situation,” the ministry’s press service quoted Avakov as saying. The group of public figures held a meeting at the regional administration office voicing mistrust to lawmakers of Kharkiv regional council. They have made public a list of people who had taken duties of lawmakers of the regional legislative council. Participants in the meeting decided to proclaim an independent state named Kharkiv People’s Republic. They stated that the decision would take effect after being approved at a regional referendum.